Nose surgery, or rhinoplasty, is one of the most commonly performed facial plastic surgery at our clinics. Also known as a nose job; rhinoplasty is designed to improve the appearance and proportion of the nose, or to correct a breathing problem. Plastic surgeon will carefully assess you physically and emotionally to ensure you are best prepared to undergo nose surgery in Turkey. During nose surgery at ESTEVIP Turkey, your plastic surgeon applies incisions to access the bones and cartilage that support the nose. The incision are typically made in subtle locations inside the nose so that they are invisible after the surgery. Depending on the desired result and appearance goals of each patient, some bone and cartilage may be removed, or tissue may be added. 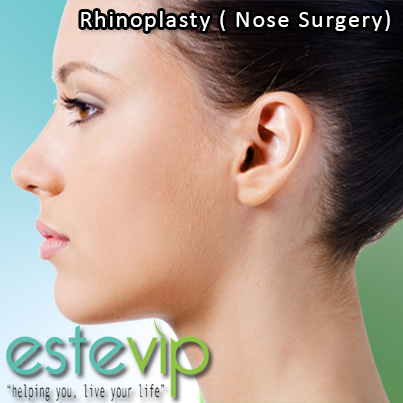 While rhinoplasty in Turkey’s ESTEVIP clinic is frequently performed as an outpatient procedure, sometimes patients may require 1-night stay.